Don’t be afraid to leap. will never get you over a big hurdle. on the other side of that hurdle. ~ Ruth Kaiser, the Smiley Lady. Sorry the photo isn’t a Smiley. 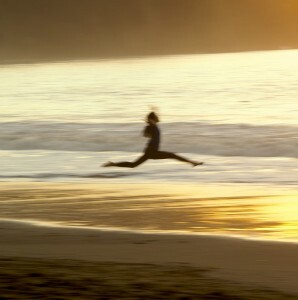 But I sure felt lucky when this young dancer surprised me with a leap at the ocean’s edge last week. Over on our calendar of a Month of Smiley Silliness it’s Compliment Your Underling Day. Always a good idea. Everybody can use a verbal boost from time to time. Today we say happy birthday to soap star Antonio Sabato (1972) and fire walking, pep talking Tony Robbins (1960). Ever wonder how you can remember if a year is going to have a February 29th? Here’s the way to always know: Presidential elections in the USA always fall on a Leap Year. It used to also be true that the Olympics fell on Leap years. That was back when the summer and winter games were both played in the same year.